Speak with Arianwyn in Lletya. Start off by speaking to Arianwyn in Lletya. He will tell you that Thorgel the dwarf has sent word from the Temple of Light. 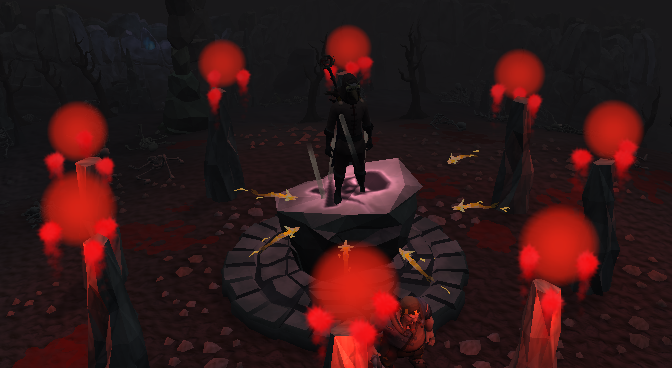 Following the safeguards being reactivated, something is happening to the final pillar. Arianwyn will be accompanying you to the Temple of Light, but first you must complete 3 tasks. First, you must get Arianwyn a set of Mourner's Gear as a disguise. You'll also need a set for yourself. Second, you need a teleport location. 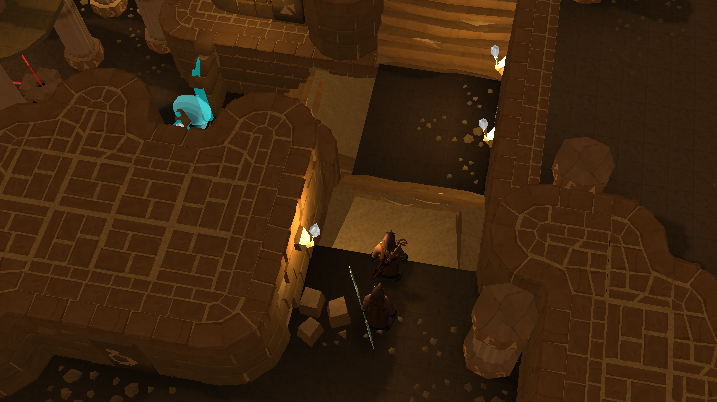 You'll need to chant at the Blank Teleport Crystal that is given to you by Arianwyn in a safe location near the Temple of Light so that you can both teleport there together. Third, you're going to need a distraction. You'll need to find someone to distract the mourners. 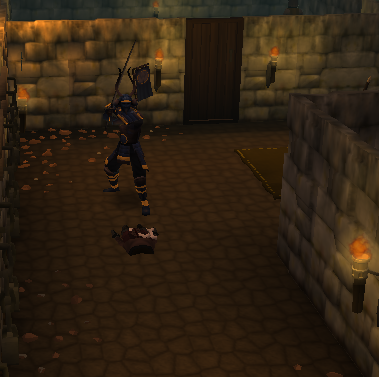 You can get Mourner's Gear by killing Mourners located in Arandar, or in the basement of the Mourner's Headquarters. If you don't already have a full set of Mourner's Gear, you'll have to go with the option of killing Mourners in Arandar. If this is the case, make sure to have some food and restore potions on you as they will lower all your combat stats to 20 (including Life Points and Prayer). 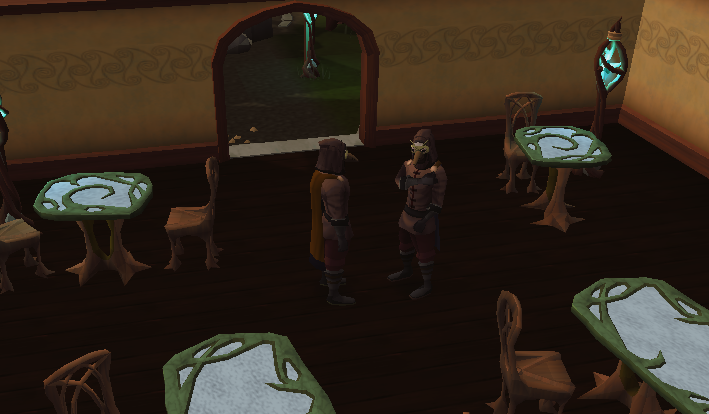 The Mourner body piece and Mourner trousers will be unusable until you have them cleaned/fixed. 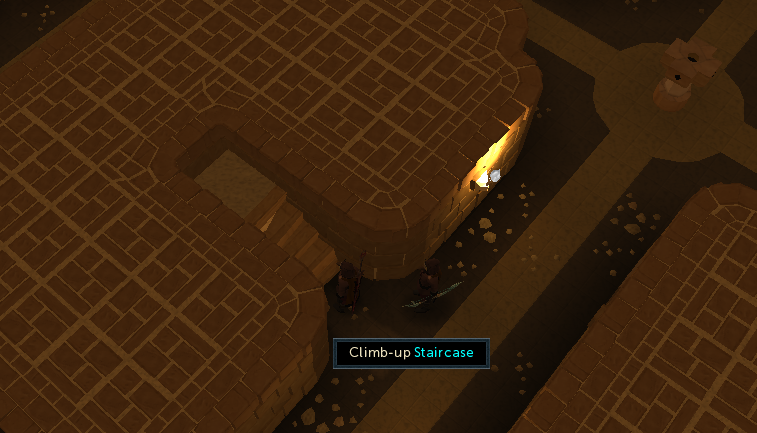 To find out how to do that, check out the Mourning's End Part 1 guide. 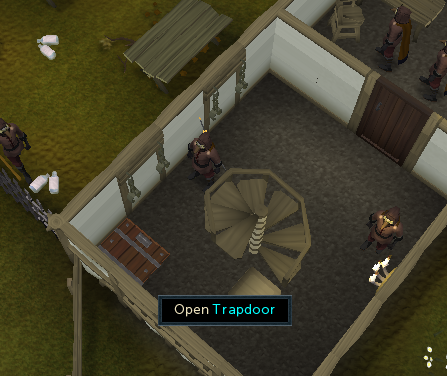 For a Distraction, start off by going down the trapdoor in the Mourner's Headquarters in West Ardougne. You'll need a Tarnished Key so you can get into the holding cell where the gnome is. If you don't have one you can get another by searching the Head Mourner's desk. You can also get A New Key from his desk, so take one of those too as you will need it later. If you are unable to take either of the keys from the table, it means that you have a copy sitting in your bank or inventory. 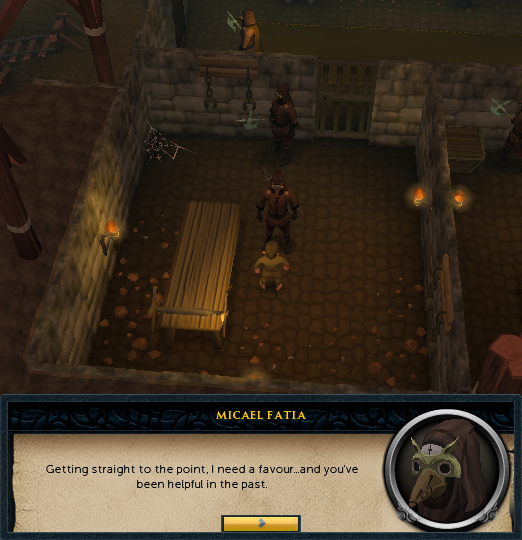 The gnome agrees to help you, in exchange that you talk to the Head Mourner about freeing him. 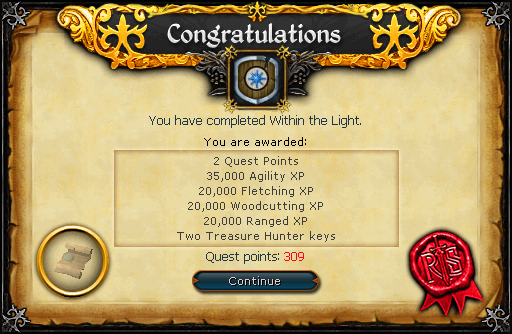 After talking to the gnome, head through the door and head over to the Temple of Light. 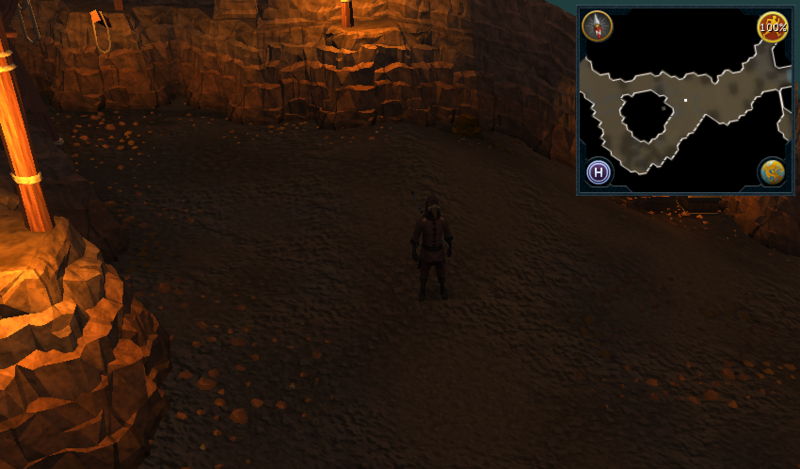 Stand somewhere around the location in the picture above, then use the chant at option on your Blank Teleport Crystal. A short scene will occur. Now that you've enchanted the Teleport Crystal, it's time to head back to Arianwyn in Lletya. Talk to him and give him his Mourner's outfit, the Enchanted Teleport Crystal, and then tell that the gnome captive has agreed to create a distraction. Now, grab some good food and Prayer Potions as well as checking your bank for a Crystal Trinket, and then talk to Arianwyn again and have him teleport you to the Temple of Light. 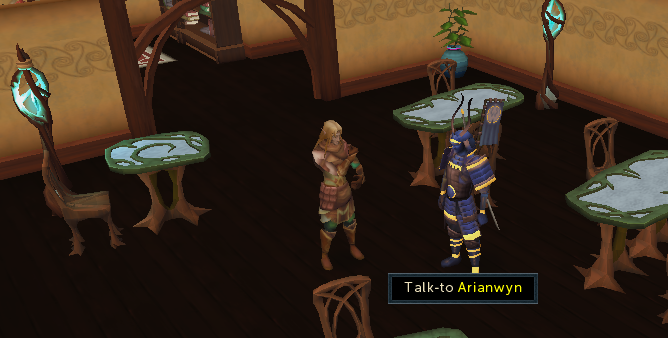 If you do not have a Crystal Trinket, talk to Arianwyn and he will provide you with one. As you go through the Temple of Light, Arianwyn will deal with the Shadows with his Crystal Bow. It is still advised to bring food and Prayer Potions as you will need them later. Enter the Temple of Light, and go up the stairs by the large crystal. Now go south and head up the first staircase. Go north, and go down the stairs, then down the other set of stairs. Pass through the light door and search the pillar of light. Rotate the mirror so that the red beam of light goes west towards the energized pillar. Now head through the light door and talk to Thorgel. Arianwyn will tell you to investigate the energized pillar. 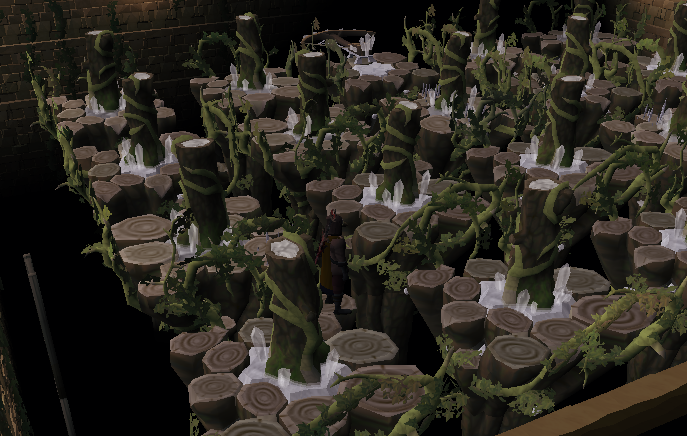 After investigating it go back to Arianwyn, then go back to the energized pillar and use your Crystal Trinket on it. It will make a pretty big spark, but it seems that isn't enough. Arianwyn suggests you energize yourself in a similar way to the trinket. 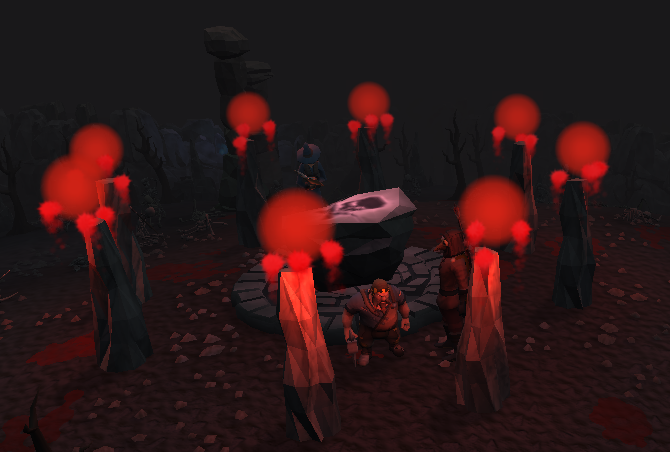 Head into the Death Altar and talk to Thorgel. He'll help you get onto the altar. Now that you're charged up, you'll have to be quick since it will only last for a minute from the end of the conversation with Thorgel. During this part you'll probably want to use Protect from Melee, because Arianwyn won't be with you to kill the Shadows. 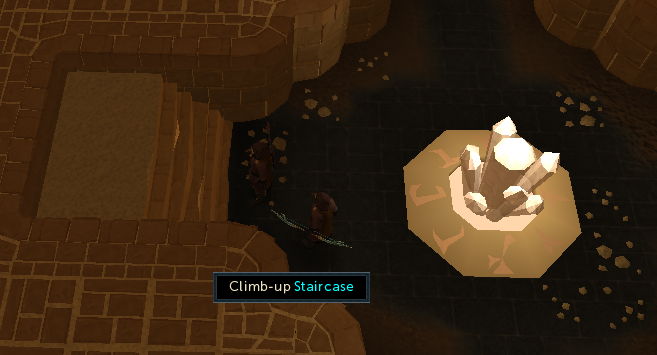 Rotate the mirror on the pillar of light so you can head up the stairs. Go up the stairs to the north, then run to the east and then to the south and touch the crystal. Now run back down the stairs, and rotate the mirror back to the energized pillar before another minute timer runs out. Touch it, and you'll be teleported. Around the middle of this area you'll find a slave body. Search it to get some notes, a Bronze Hatchet, a Colour Wheel, and a Knife. The east side has three light emitters: one blue, one red, and one green. The west side has four light receivers which will change colour as the puzzle continues. 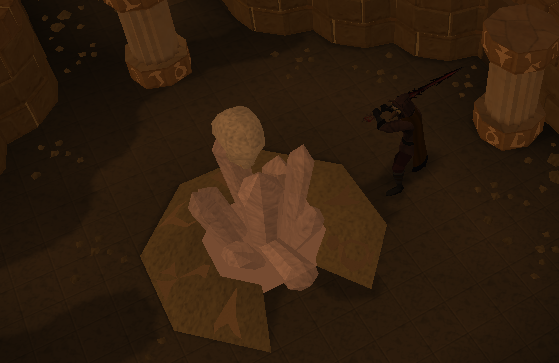 You will need to chop the crystal trees, rotate the crystal cores, and use the Colour Wheel to guide the light beams. Each of the rotatable crystal cores has one face which will turn a beam 90° and a hole that will allow a light beam straight through. This allows you to combine multiple beams of light so that a different colour beam is formed, or simply make a beam turn. Examining a light beam will tell you what colour it is. Once you've guided all the beams into the black receiver head up the ladder. You will find yourself in a room full of platforms. You will have to jump from platform to platform all the way to the crystal ballista. Some of these platforms have spikes that come out, and if you stand on them they will do up to 700 damage to you, so you'll need good timing. Before jumping onto another platform, ensuring you know how the spikes appear on the next two will allow you to anticipate what is coming and not become caught off-guard. 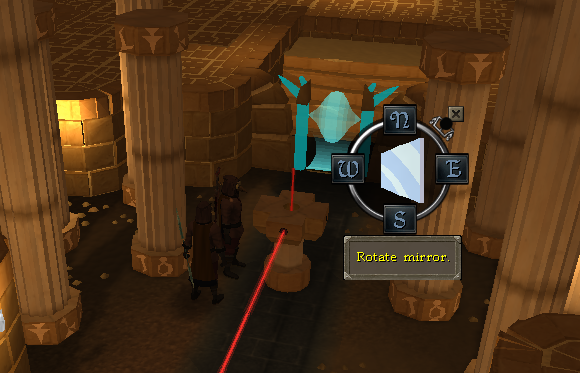 Once you reach the crystal ballista, hit the moving target to open the large door. Now go back through the platforms and go down the ladder. Head through the now open large door. 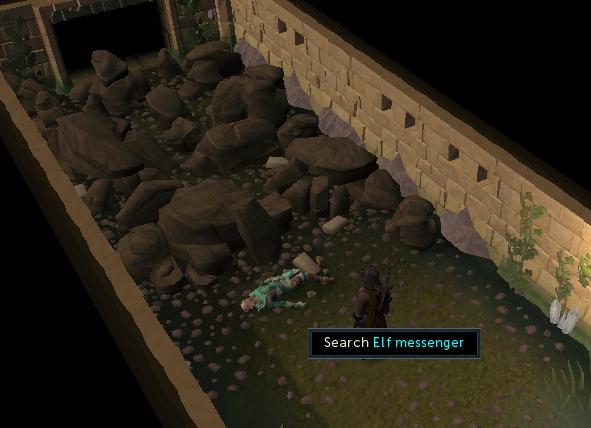 Here you'll find a dead elf messenger. Search him and you'll get a Report. 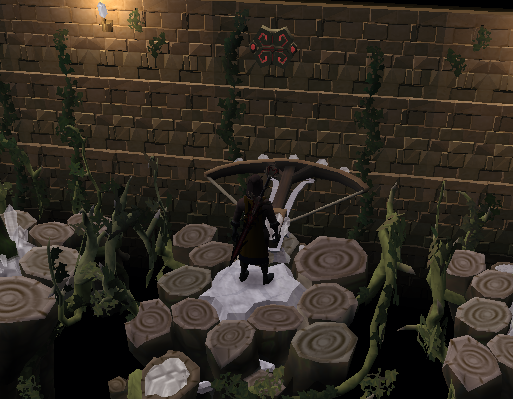 The report reads that there is a route between the temple and the under-city, under Prifddinas which was converted to a crystal seed form. Now head back through the door, and exit the area through the portal. According to Thorgel, who is still at the Death Altar, Arianwyn has headed back to Lletya. Go back to Lletya and talk to Arianwyn.